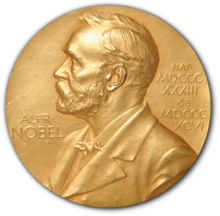 The Nobel Peace Prize (Swedish, Norwegian: Nobels fredspris) is one of the five Nobel Prizes established by the will of Swedish industrialist, inventor, and armaments manufacturer Alfred Nobel, along with the prizes in Chemistry, Physics, Physiology or Medicine, and Literature. Since March 1901, it has been awarded annually (with some exceptions) to those who have "done the most or the best work for fraternity between nations, for the abolition or reduction of standing armies and for the holding and promotion of peace congresses". Per Alfred Nobel's will, the recipient is selected by the Norwegian Nobel Committee, a five-member committee appointed by the Parliament of Norway. Since 1990, the prize is awarded on 10 December in Oslo City Hall each year. The prize was formerly awarded in the Atrium of the University of Oslo Faculty of Law (1947–1989), the Norwegian Nobel Institute (1905–1946), and the Parliament (1901–1904). Due to its political nature, the Nobel Peace Prize has, for most of its history, been the subject of numerous controversies.